Alex is our receptionist here at Blossomtree. She organises appointments, takes care of payments and rebates and will do her best to answer any questions you have for her. Alex tries her best to make the waiting room a fun place and encourages everyone to draw some pictures, read a book or even challenge kids to a game of UNO if she’s not too busy. When she isn’t at work, Alex loves to play in music groups around Ballarat. 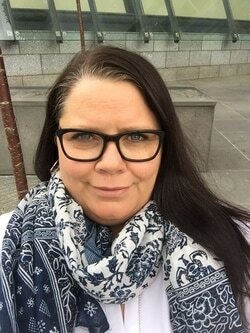 Michelle (Chelle) Taylor is a registered Clinical Psychologist with over 20 years experience working in government departments and community service organisations in remote rural and regional centres in Western Australia and Victoria. Chelle specialises in the provision of therapy to infants, children, adolescents and families who have experienced disruption in the development of attachment in primary care relationship and/or developmental trauma such as abuse and neglect. Chelle is committed to providing family inclusive, client centred services to her clients. Working with the child in the context of their family or care relationships is an essential approach for Chelle in her work with children and adolescents. Years of working with involuntary clients has given Chelle a real skill in engaging children and young people reluctant to participate in “therapy”. Child clients and their families have often commended Chelle on her ability to put clients at ease, establish safe therapeutic space for children to address difficult issues and to support and manage these competently. The ChildTrauma Academy acknowledges that Chelle has completed Neurosequential Model of Therapeutic NMT Training Certification through the Phase II level. Chelle’s practice and interventions are informed by her expertise in neurodevelopment and children. During 2012 and 2013 Chelle, together with Dr Bruce Perry of the ChildTrauma Academy and Annette Jackson Take Two Directory at Berry Street, co facilitated the Australasian NMT Case Based Training Series an online training program in NMT. Between 2010 and 2014 Chelle led Berry Street’s Take Two program in its certification and implementation of NMT. 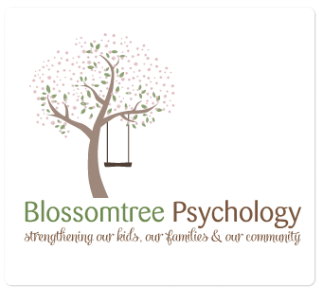 If you have trouble downloading Chelle's paper and would like a copy, please email hello@blossomtreepsychology.com.au and we can email it to you. Chelle is a trained Narrative Therapist and also uses Cognitive Behaviour Therapy, Play Therapy, Family Therapy, Mindfulness, Dyadic Developmental Psychotherapy, and Solution Focussed Therapy in her work. Chelle is also an accredited facilitator of the Tuning into Kids Emotion Coaching group therapy based program and the Holyoake Drumbeat Program for social and emotional development in children. Chelle is a member of the Australian Psychological Society, and a registered provider with Medicare. Jess is a registered Clinical Psychologist who has completed a Doctorate in Clinical Psychology. Jess has previously been working with infants, children, adolescents, and their families within the child protection system for over six years. Through her previous role as the Therapeutic Specialist within a community service organisation Jess has developed expertise in the diagnosis and treatment of a large range of mental health concerns including depression, anxiety, grief and loss, and a comprehensive understanding of complex trauma, attachment and behavioural problems for children of all ages. Jess is passionate and committed to providing a space where children, parents and families can feel safe, listened to, and supported to work together towards mutually agreed goals. Working from a child-focussed and strengths based perspective with children and their families, Jess helps children to recognise their strengths and develop their skills, while supporting their family to understand their child’s needs and support them. Jess has strong skills in engaging children and adolescents who may be hesitant to seek help or speak to a “therapist”. She strongly believes in the importance of providing a personally tailored approach and ensuring that a trusting, supportive and honest relationship is formed between herself and those she works with. Jess draws on evidence-based interventions including Cognitive Behavioural Therapy, Play Therapy, Dyadic Developmental Psychotherapy and Family therapy in her work, and works from an attachment and trauma informed perspective. Jess also has significant experience and expertise in training, educating and supporting parents and carers, as well as teachers and other staff who care for, and work with, children who have complex needs. Jess is a member of the Australian Psychological Society, and a registered provider with Medicare. Prue is a registered Psychologist who has completed a Masters in Clinical Psychology and is a member of the Australian Psychological Society. Prue has always had a keen interest in learning tools that improve people’s wellbeing and quality of life. Before becoming a psychologist, Prue taught mindfulness techniques, mediation, relaxation and yoga to children, adolescents and adults for over 16 years. Over the last two and a half years, Prue has provided psychological treatment and conducted psychological, cognitive, academic and behavioural assessments for children and adolecents within school and community based settings. Prue values working collaboratively with children, adolescents and their families on a range of issues including depression and anxiety, parenting, trauma, attachment, emotional distress, behavioural regulation and coping and adjustment difficulties. With a calm and practical approach, Prue strives to create a relaxed, supportive environment for children and their caregivers, enabling them to feel comfortable to explore thoughts and emotions in relation to challenges they may be facing. Prue’s authentic, down to earth and gentle nature enables her to connect and relate well to children, and helps her establish a good rapport with those she works with. Prue tunes in to the needs of the client and their families making them feel heard, respected and validated. Prue understands the importance of working together with kids, their families (or care givers) in order to determine which therapeutic approaches may fit their personality, culture, values, goals and strengths. Her treatment approach encompasses creative and developmentally appropriate strategies to foster healthy brain development, emotional connection and self-worth. She aims to promote psychological and emotional understanding and provide tools for families and children to develop life skills, promote healthy and adaptive living behaviours and fulfil emotional and practical needs. Prue draws on a range of evidence-based therapies including Cognitive Behaviour Therapy, Acceptance and Commitment Therapy, Motivational Interviewing, mindfulness and strength focused therapies. Prue is a member of the Australian Psychological Society and a registered provider with Medicare. Bonnie is a registered Clinical Psychologist who has completed a Masters in Clinical Psychology and Clinical Registrar program. Bonnie has worked within secondary schools and community based settings for the past 2 and a half years, providing psychological treatment and a range of cognitive, academic and behavioural assessments for children, adolescents and adults. She has gained experience in diagnosis and treatment of a range of mental health concerns including anxiety, depression, difficult behaviours, complex trauma and disordered attachment. Bonnie is passionate about integrating innovative ways to engage with children and provide a personalized experience of therapy. By completing training in art and play therapy and Animal Assisted interventions, Bonnie continues to develop skills to provide a tailored experience of therapy. Bonnie completed her training as an Animal Assisted Psychotherapist in February 2017, and provides interventions with her co-therapist, Harlow. During sessions, Bonnie aims to provide a space of compassion and understanding, in which children of all ages can feel safe to express and process their personal experience, and develop a greater understanding of their thoughts, emotions and behaviours. Bonnie understands the importance of providing a holistic approach to working with children, which involves close communication, psychoeducation and skills building with all important members of a child’s support system. Bonnie draws on evidence-based therapies including Acceptance and Commitment Therapy, Mindfulness, Cognitive Behaviour Therapy, Art and Play Therapy, and works from a trauma informed perspective. Bonnie is a registered provider with Medicare. Meriana is a registered psychologist who has completed a Masters in Clinical Psychology and is a member of the Australian Psychological Society. She has spent the last two years completing her training in university and private clinic settings as well as in a public hospital setting. She has gained experience working with children, adolescents, and their families. Meriana has provided extensive cognitive and academic assessments to children and adolescents to aide in the diagnosis and treatment of a wide range of mental health concerns. She has provided therapeutic interventions to children and adolescents to help manage behavioral concerns, anxiety, depression, relationship difficulties and complex trauma backgrounds. Meriana is passionate about integrating evidence-based therapies such as Cognitive Behaviour Therapy, Acceptance and Commitment Therapy and mindfulness into a trauma informed framework. When working with children and their families, she understands the importance of creating an environment where both can feel comfortable to share how they are feeling and what they are thinking. Her approach is sympathetic and considerate, ensuring to create an environment that is conducive to building a strong relationship with her clients as the basis of treatment. She believes strongly in collaborating with families and empowering them with the skills to build on the progress made within sessions. Meriana strives to provide a tailored approach to meet individual needs and differences in strengths, values and goals. Meriana is a member of the Australian Psychological Society and a registered provider with Medicare. Sue is a registered Psychologist who has completed a Masters in Clinical Psychology and is a member of the Australian Psychological Society (APS), and APS College of Clinical Psychologists. Before becoming a psychologist, Sue worked with rural and regional communities with a focus on community development, sustainable farming and natural resource management. Since transitioning to psychology, Sue has been providing psychological services across a variety of settings including schools, public allied health facilities, and community health clinics. Sue has extensive experience in the provision of psychological, cognitive, and academic assessments for children, adolescents and adults. She is skilled in the application of a range of evidence-based psychological therapies including Cognitive Behaviour Therapy, Acceptance and Commitment Therapy, Brief Solution-Focused Therapy, and Mindfulness-Based Therapy. Sue has experience working with children and adolescents with learning difficulties, challenging behaviours, emotion dysregulation, trauma, and attachment concerns. Sue also has particular interests in depression, anxiety, sleep difficulties, supporting young people to manage chronic illnesses, and providing parenting support. Sue’s therapeutic style is warm, empathic and compassionate. She aims to create a calm and supportive environment, and where possible works in collaboration with families, schools and allied professionals to improve children’s emotional wellbeing and family functioning. Sue is a member of the Australian Psychological Society and a registered provider with Medicare. Denver and Cally are Chelle's canine co-therapists. In August 2016, Denver became a certified Therapy Dog after a long week of training and having to sit some practical exams. Denver is a 3 year old chocolate Labrador. Denver has been at the clinic since he was 8 weeks old, and together with Chelle, is trained to an Advanced Level of Animal Assisted Therapy and Canine Interventions with Lead the Way Psychology and Animal Assisted Therapy and Alpha Canine Professionals. Denver loves people, (children especially!) and can be very excitable and he can sometimes forget that he's at work. You can tell when Denver is excited because he wags his whole body! Denver has his favourite spot on the couch and is likely to curl up alongside you and go to sleep while you pat him, sometimes even with his head in your lap. Cally is a 2 year old black Labrador. She didn't have the best start to life, and people didn't treat her very nicely. In fact like lots of the kids Chelle sees, Cally was in Foster Care, but in 2017 Chelle adopted her and brought love back into her life. Chelle and Cally have worked really hard on learning to trust each other and work together. Cally's favourite things are; pats, playing with her brother Denver, pats, toys and pats. Did we mention she loves pats? Cally hasn't sat her Therapy Dog exam yet, but she is learning fast and will soon do the extra training needed to get her Therapy Dog qualifications and coat like Denver. Denver and Cally come to work with Chelle most days and when she is at work, they are always in Chelle's office. Sometimes they will come into reception to say hello on their way outside for a break or coming back inside from a break. Denver and Cally have a big crate in the office so they have somewhere to go and have a rest but also somewhere safe to be if you don't want them to be part of your appointment or if you might be scared of them. If you don't want Denver or Cally to be a part of your sessions with Chelle, be sure to let her know, or get your Mum and Dad to tell them, and they will make sure Denver or Cally are safely in their crate. ​Harlow is Bonnie’s canine co-therapist! Harlow is a 2 year old Golden Retriever. He became a certified Therapy Dog in February 2017, when he was just 6 months old, and has been working with Bonnie ever since in both a secondary school and private practice. Harlow is very gentle and calm (maybe even a little bit lazy)! Harlow really loves going to work with Bonnie so he can spend time with children and adolescents and have lots of pats and cuddles! He is very loving and sensitive to the mood of others, and will curl up close if you need cheering up. Harlow needs to go for walks regularly and welcomes pats from those he sees in the office! If you don’t want to work with Harlow, or don’t want him close, let us know and we will let him have some time off in his crate. If you would like to keep up to date with Harlow, you can find him on his very own Instagram account, harlowthetherapydog.